Arbor Day. Aston-on-Clun, Shropshire 1975. The custom of dressing a tree with flags survives from an ancient era when it was done in worship of Bridget, goddess of fertility. Later sanctified as St Bridget or St Bride, the goddess had a tree for a shrine. Hopesay Parish Council now finances the custom from the rates. 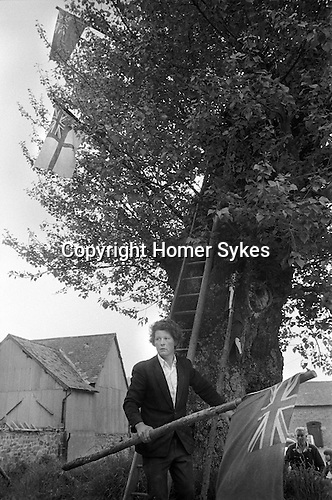 In 1975 twenty-five pounds was given to buy nine flags that are used to decorate the Black Poplar every 29 May.